I attended the China Australia Millennial Project (CAMP) conference which brings together 130 innovators from China and Australia. I was sponsored to attend the conference as the lead delegate for the University of Technology Sydney (UTS). “How to get traffic to your website and convert visitors”. The attendees come from a diverse professional background – civil engineering, teaching, law, accounting, government, tourism and IT. Many of the attendees had limited to no marketing experience. Also 50% of attendees were from China and spoke English as a second language. So the talk had to be simple, concise and entertaining. In fact, the best talks often are. The best talks get across one key point which you walk away with. It really forced me to figure out what were some key takeaways I could give them in 20 minutes. The #1 takeaway in my presentation is that a conversion funnel is a series of steps on how to convert a visitor into a customer. Its how we visualise the online marketing process. This presentation focuses on free or cheap marketing techniques. This is because for the CAMP conference we were in teams working on projects. I assumed that the teams did not have a budget to spend on paid marketing. I also wanted to give them some inspiration to start digital marketing. 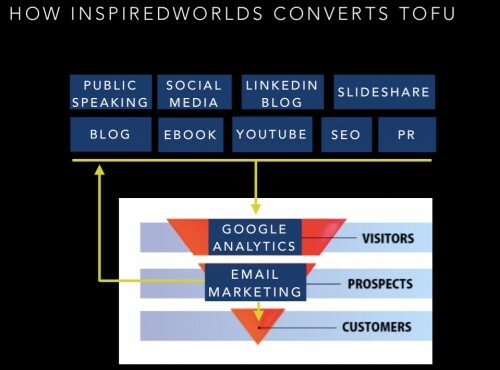 The conversion funnel model applies whether you do free or paid marketing. 1. Conversion funnel is a visual model of how to get traffic to your website and convert them into customers. Typically the TOFU/MOFU/BOFU breakdown is used for inbound marketing, but I believe it also applies to online marketing generally. There might be different labels and breakdowns, but fundamentally it is the same model. I listened recently to Hiten Shah on Startup Chat podcast describe how he views freemium as a marketing strategy to increase ToFU user base. As the product is free, they have a larger base of users. Then you have to figure out how to retain them (MoFU) by having a good product. 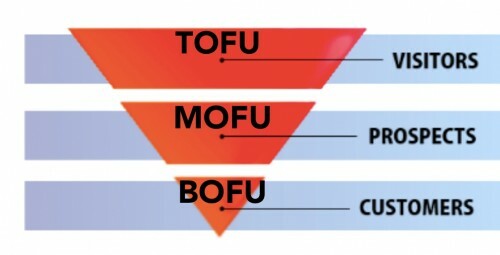 As ToFu and MoFU are substantially larger, this gives them more chances to convert them to being a paid user for BoFU. 3. There are a variety of sources of ToFu traffic. This includes email marketing, SEM, SEO, display advertising, social media, content marketing, PR, partnerships, contests and more. 4. One method of converting visitors to customers is using email marketing and email automation. Email helps you retain and qualify prospects. This is what I do for my blog inspiredworlds in the picture below. 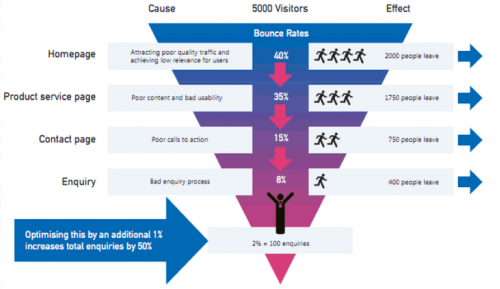 Without enough traffic, you may be incorrectly optimising conversions. For example if you have 5 visitors to your website a day. Optimising based on limited traffic is not sufficient. 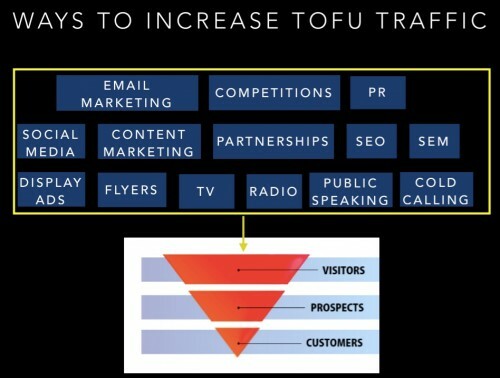 Hence we need to increase ToFU traffic using free and/or paid marketing. 6. We work on the part of the funnel where we need the most help. If you poured water into water funnel, 100% of the water would reach the bottom. However in online marketing, 100% of the visitors do not reach the bottom of the funnel. This is because not everyone that goes to a website or app will take an action on the website and ultimately buy something. So we need to look for areas of leakage in the funnel. By reducing leakage at a particular stage, we can increase conversion. This is an example of leakage and improving conversion. This is the full presentation below. Paid marketing should be part of the overall marketing strategy on how to get traffic to your website and ultimately customers. You need to experiment with a range of channels. Once you have figured out some that work, start with 1 free channel and 1 paid channel. You need to be able to master 1-2 channels first, and then expand to more. You can start with paid marketing because it can immediately bring in customers and its scalable. To maximise ROI (return on investment), this requires a good understanding of the conversion funnel. For example, you can start driving traffic using SEM (search engine marketing). But you also need to optimise your landing pages and be tracking conversions when they get there. You need to know the cost of customer acquisition and customer lifetime value. You can also use paid marketing together with free marketing. For example, write some content such as an ebook. Then do paid promotion on facebook, twitter, linkedin, adwords for the ebook to get visitors to download it.